On your marks, get set . . .
On a distant planet that serves as the Empire's grid-widget factory, the various control computers went about their daily routine. These sophisticated computer were fully equipped with standard intelligence modules to handle any situation which might come up at the factory. Unfortunately, it was this intelligence that made it difficult to bear the months of routine maintenance which bored the computers to electronic tears. For year they had combated boredom by diversions, such as chess. But after several bagillion draws during the last tournament, the computers concluded they were too evenly matched. An archaic janitor robot's radio contact died. Using its rudimentary programming, the robot accidentally wandered into a grid manufacturing center. There it was spun by conveyor belts and fried by industrial lasers, and (as its last circuits blew trying to avoid a bottomless heating shaft) the robot got crushed into a molecular wafer by a widget compressor. 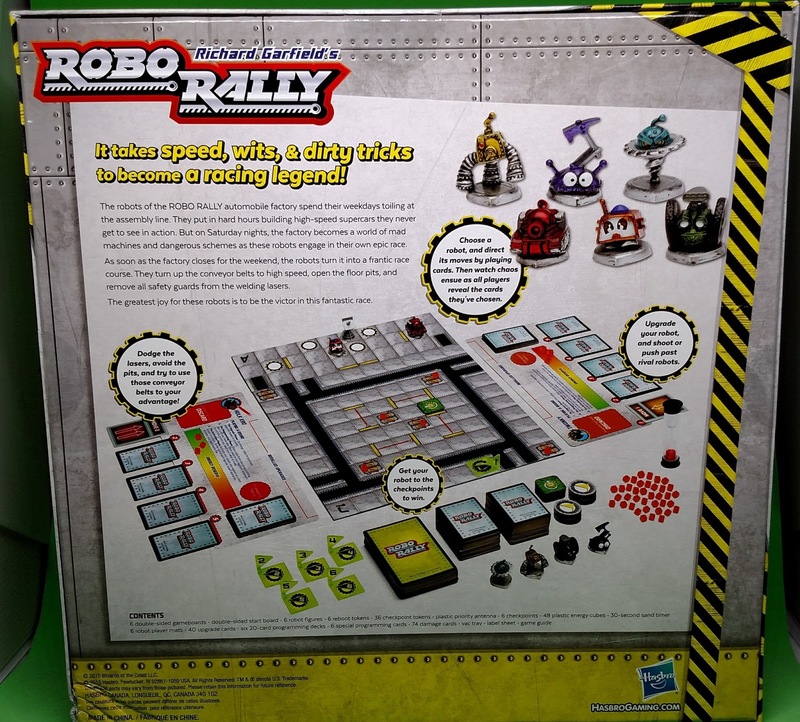 Twelve microseconds later, they held the first "robo-rally," a race across a deadly, ever changing factory floor between eager robots with intelligence rivaling that of an average door knob. Like so many other geeks out there, certain events became turning points in our lives. Not just your wedding, the births of your children, unfortunate deaths in your family, graduations. Those happen to everyone. No, geeks are influenced by movies, games, books. I've been a game since almost as long as I can remember, but for a while after college I wasn't really playing. I had found a game store across the street from our house, and I would go there and look in wonder a bit. My wife had a friend of hers introduce me to her husband 22 (or so) years ago, who offered to teach me that new game, Magic: the Gathering. We then found we had a mutual love of board games, and started playing them more and more. It doesn't hurt that I then moved a block away from him (and later moved a block away in the other direction). Our kids (my four, his two) played all the time. He also introduced me to gaming conventions, taking me to my first Origins (I'm guessing either 1994 or 1995). It was just for Sunday. In the huge demo hall, there was a guy running a game on a giant board in his stocking feet. 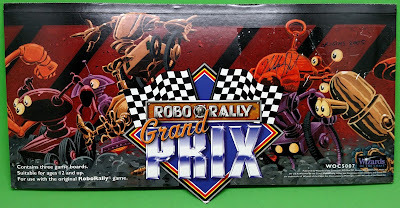 Giant Robots (about 2 feet tall) where being pushed around - and when I found that you actually programmed them, and the board moved - well one demo and I was hooked. I picked up a copy of the game, and it truly was the point where I became a gamer as an adult. Since then I've gotten into miniature games much more (though I did paint up the original metal minis), but this is still one of my favorites of all time. I was surprised then a few weeks ago, while doing a demo of The Walking Dead: All Out War to see a brand new edition on the shelf. I finished my current demo and went to take a look, and it was gone. I did however see a woman about to check out with it, so I asked to see it. Pre-painted minis and a new edition - I had to have it - though of course I handed it back to her. Christmas morning it was mine from my son. 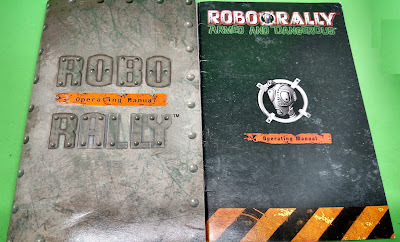 So what better excuse for a post than to do an unboxing and comparison of the 1st, 2nd and 3rd editions. 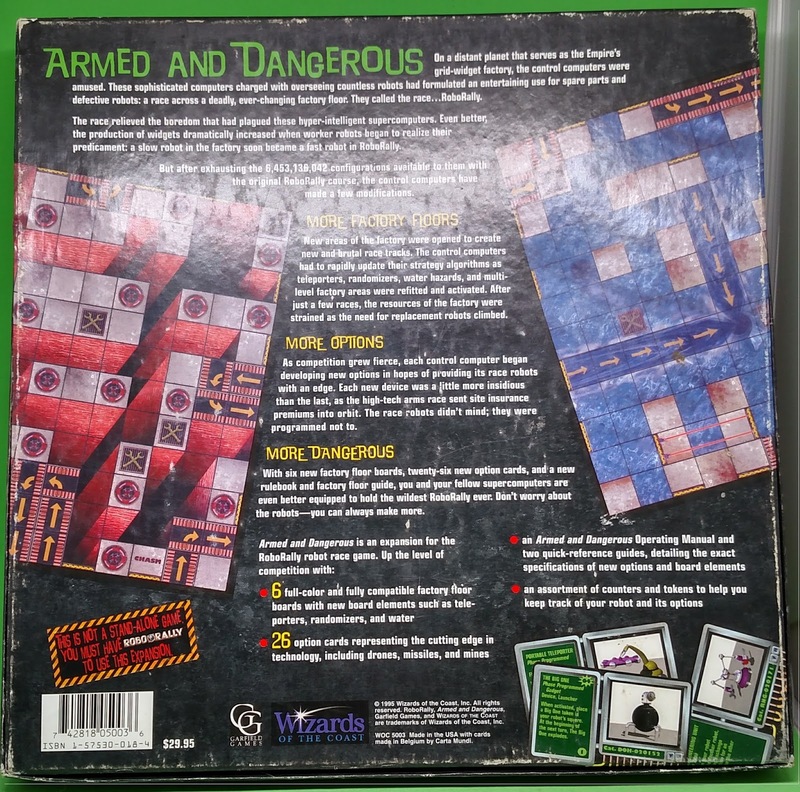 The first edition came out in 1994, and eventually had 5 expansions for it - all of which I own and have had signed by Richard Garfield himself. Several years back I was able to actually play with him at Origins in a "Play with the Creator" event - and of course I brought all of mine. That actually was not the first time I met him however. 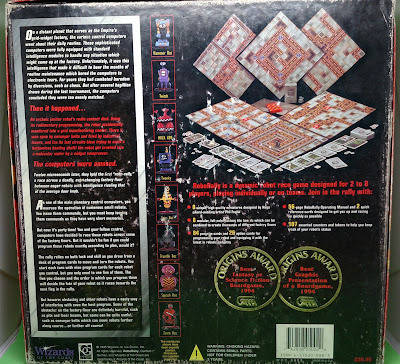 Back when it first released and they had the giant version for conventions, Wizards of the Coast (now part of Hasbro, and the game has been moved to Avalon Hill) they had the world championship at Origins. 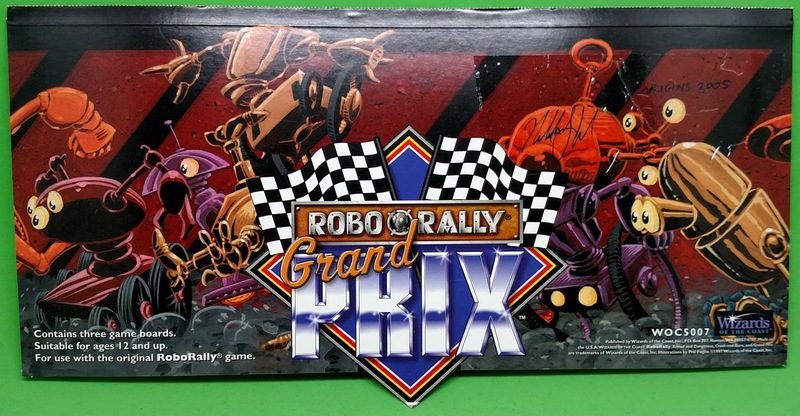 I remember Paul Randles running these - they even had six (maybe eight) different sets with the robots painted the same colors for each set. Crash and Burn - the first board only expansion. Of course I was eliminated in the first round, but I had nothing else to do, so stuck around, and ended up running the time clock (i.e. my watch) for the championship round, then again for the first ever champion challenge - where the winner and runner up played against Richard Garfield and Peter Adkinson. The next year I did the same thing - but this time the winners and the previous years winners played in a tag team challenge with the famous King of the Hill board. So of course I had to have a ticket when I could play with/against the man himself. Let me tell you, that was truly an awesome experience. You have to understand, Richard Garfield has a PhD in combinatorics (also known as game theory), a branch of mathematics dealing with discrete probability. So not only did he know the game (having created it), but he also knew the math behind it, and how to use it. Watching him play, it quickly became obvious that he was playing at a completely different (higher) level than anyone else. Using his knowledge of the cards and the probability of the cards, he was able to accurately predict others moves and take advantage of them. One turn he managed to be pushed by three different opponents - to end up EXACTLY where he intended (even healing the single point of damage he received). 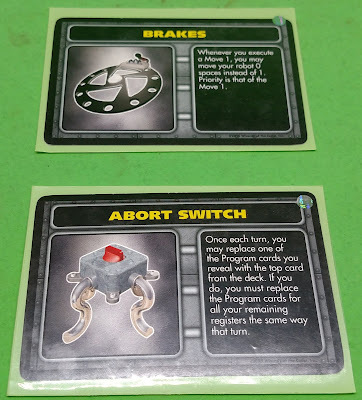 He was able to use the abort switch option to get better cards - an option that every time I got it I immediately used it as the first point of damage because I thought it was worthless - but he loved it. (He did say to plan your move first, then find the cards in your hand to do it, rather than try to figure your move based on the cards - a strategy that is non-intuitive but really works). When I played him, it was with the newer 2nd edition. 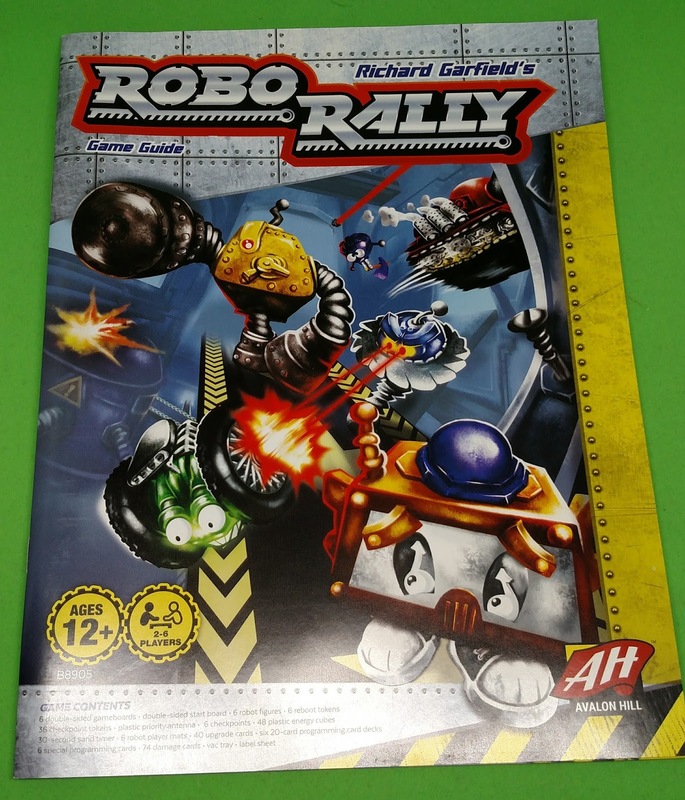 This edition eliminated one of the only issues with the first version - the idea of virtual robots. 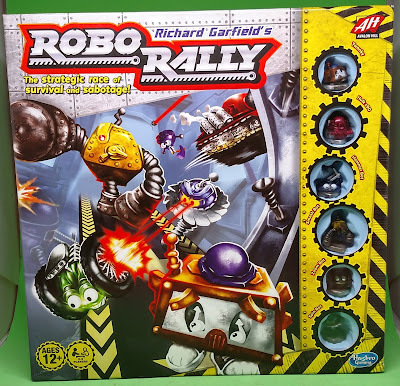 In first edition all robots started on the same spot, and could not interact with each other at all on the first turn because they were 'virtual'. If any two ended up on the same space at the end of the turn they continued to be virtual, while all the others became normal. In addition, if two robots were killed on the same turn and re-spawned in the same space, they would be virtual until they ended up on different spaces at the end of any phase. They eliminated virtual robots by adding a separate 'starting' board, so no robot started on top of another. 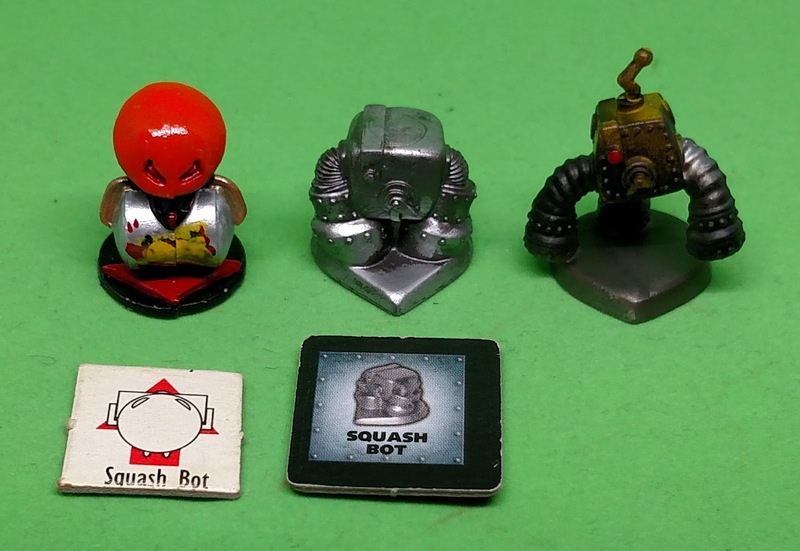 The robots were not plastic - though I didn't care for the sculpts as the original Phil Foglio versions. In addition, for some unknown reason, they switch the sculpts for they renamed the existing Hulk X90 bot as Squash bot (eliminating the old roller version) and came out with a tank for Hulk X90. 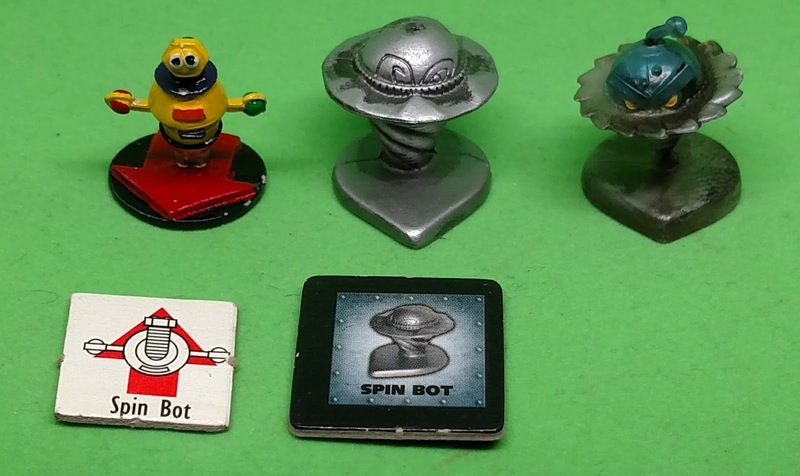 Zoom bot also became a saucer, but that wasn't as big a deal to me. 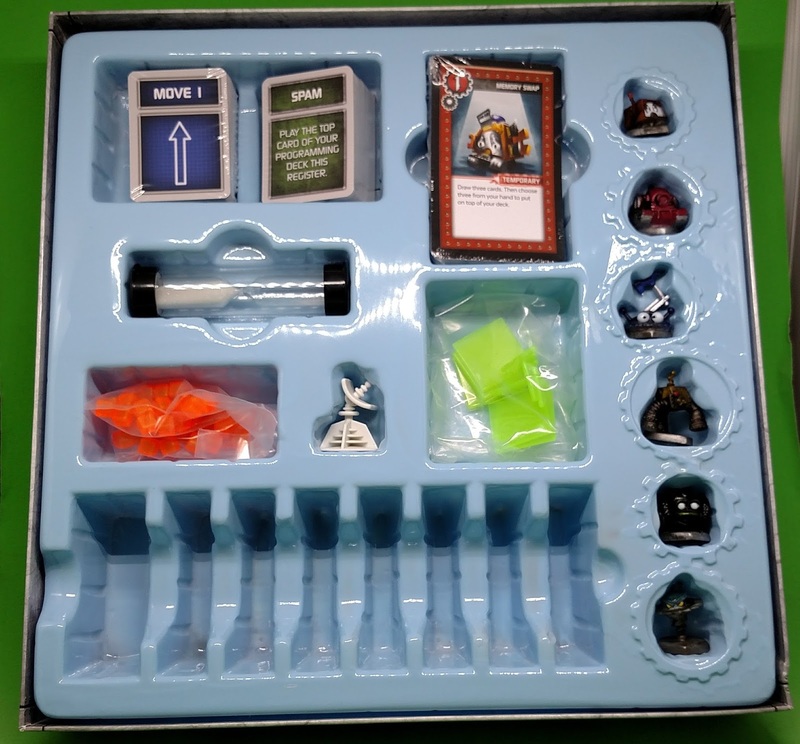 Of course being a new edition, they streamlined everything and did not have all the options and tokens from the previous expansions - however I could live with this as I hoped they would re-do the expansions (however this was not to be). I was a little disappointed in the boards however. 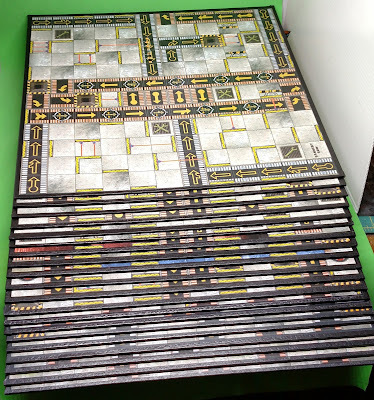 First edition had traditional heavy game boards - thick with a bit of cloth wrapping on them before the graphics were applied. Think of your old monopoly or risk boards. The new boards were about half as thick and simple heavy card stock. 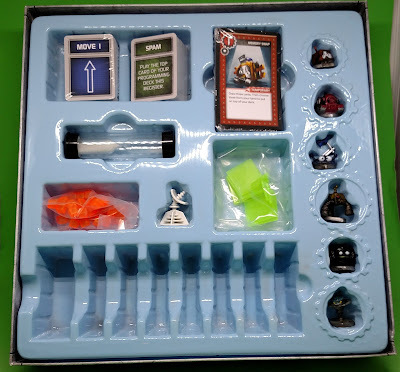 Playable, but they didn't have the durability (or the heft) of the first edition boards (my box containing ONLY the boards surprised me when I pulled it out of the closet with its weight). 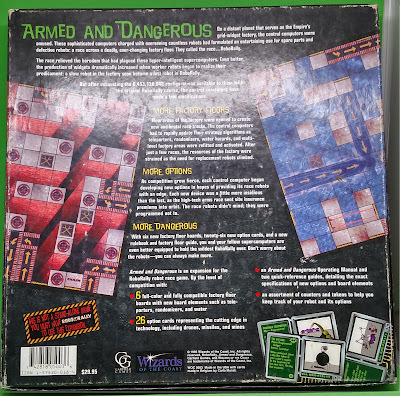 The game had not changed significantly between editions however - and you could easily use the old boards with the newer rules. You could even use the old options, though they tended to be clunkier now with all the tokens required, so we never did. I got a lot of play out of this however - even to the point of taking it in to work every few weeks and getting a group (most of whom were not 'gamers') to play at lunch. 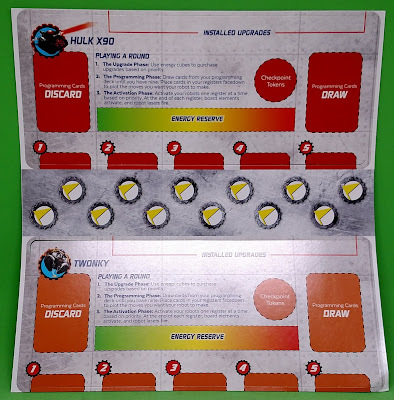 they also added player cards - something that I had seen many people create on their own for first edition - this was a nice add on. Then the kids got older and moved out - I changed jobs and no longer lived down the block from my friend, and rarely played much anymore. It is interesting that we decide to break it out at Thanksgiving this year to play a round (and I won, thanks to Richard Garfield's advice). A couple of weeks later I saw the new edition at the game store. Of course, the first thing I saw was the new sculpts - and they were pre-painted. However there were only six instead of eight - but I could live with that. Opening the box was . . . interesting. Small and large cards - and what are the orange cubes and white thing - plus the slots for cards? 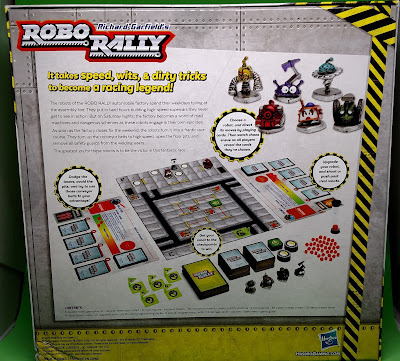 I recognized the timer, 3d flags and of course the new robot sculpts. 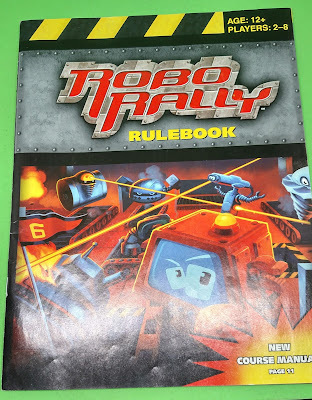 The rule book was bright and colorful - with robots shooting each other and being pushed on conveyor belts - very appropriate. There was a new start board - two sided, and again only six spots (since they reduced the number in the game from 8 to 6). 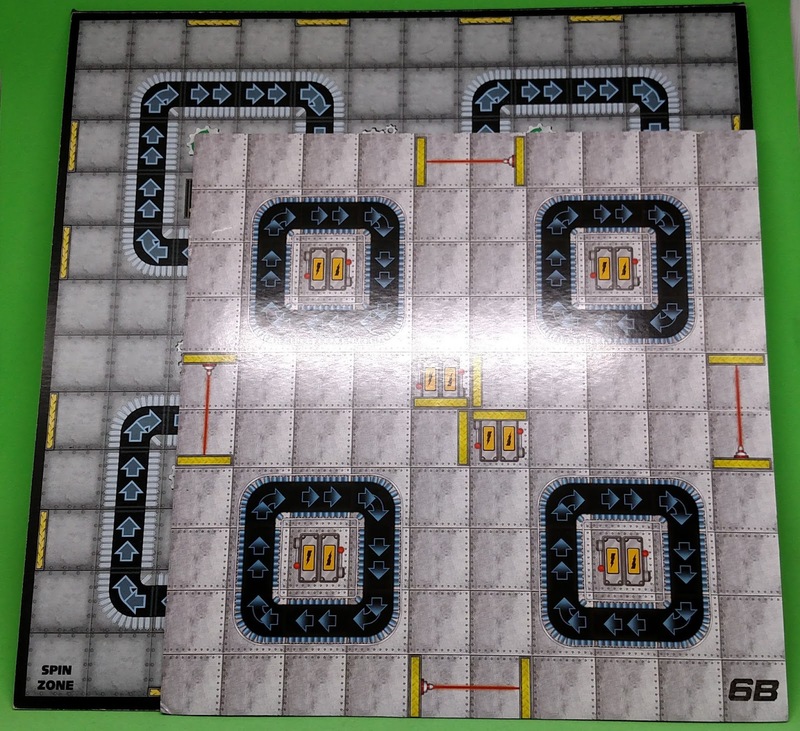 This is on much thinner cardstock, and has (what I would later find to be) reboot counters on it as well. It again comes with player mats for each robot. However these are not the same, or even similar, mats compared to those that came in 2nd edition, with the sole exception of the numbered slots to place your programming cards. In addition there are tokens. Ok, at this point I'm starting to think that there are more than minor cosmetic changes to my favorite game. Draw and discard piles? The back of the play mats gives more details about each robot. Then came the boards. They are again double sided, but also thinner card stock. I didn't notice at first glance until I started comparing them to previous editions, but they have also been reduced in size from 12x12 to 10x10 (and even just a tiny bit smaller). No wrenches either - just batteries? I was also disappointed to see the boards were now just numbered, instead of named like in the previous two editions. 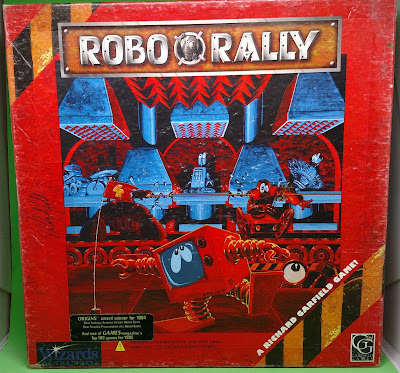 Sorry, it just isn't nearly as much fun to talk about your robot rebooting on board 4A as compared to going down the center of "Maelstrom" or being crushed in "Cannery Row"
The player mats have also changed. First edition did not have them, and several people made their own (I remember actually offering to buy them at Origins). 2nd edition added them, and 3rd has the new versions. The new ones are pretty thin card stock - they may need to be laminated to hold up to a lot of wear. 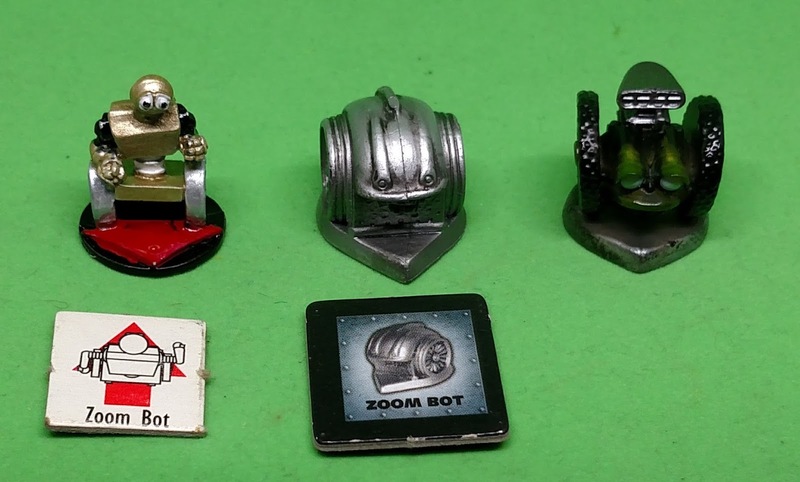 The thing that originally attracted me to the game so many years ago were the fantastic robot sculpts by Phil Foglio - so fun and characterful. So time to compare the three editions. First up is my favorite - Twonky. The walking tv set was such fun. 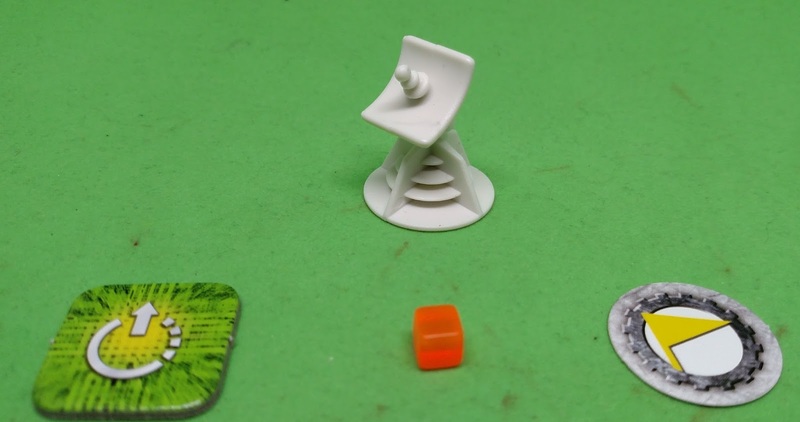 I do have to acknowledge that the plastic sculpts in 2nd and 3rd edition make facing much simpler with the arrows for the base (instead of the round base with an arrow on it). 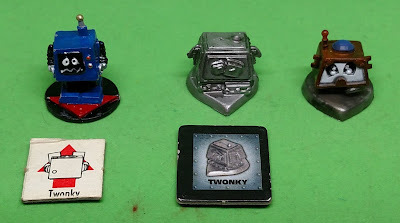 The more 'squished' version of Twonky just lost some of the character - and the third edition one, while trying to keep the worried eyes, just doesn't have that feeling of humorous despair and impending doom that made the first edition bot so much fun to play with. He had the best backstory as well, as he was the only robot that was fully aware of what was happening. In the original back story, the super computers that run the factory were bored, until a malfunctioning robot wandered into the wrong area of the factory and was crushed, and they were amused, and thus the first RoboRally was born. Most of the robots are only semi-aware - following the orders given to them and doing what they are told, happy to be of service and useful (so they think). Twonky knows what is going on even as he is powerless to stop it. The character of the sculpt plays this for humor instead of the existential crisis that it is perfectly. Note here how the third edition no longer has a counter for the re-spawn location (or for the virtual bot in 1st). 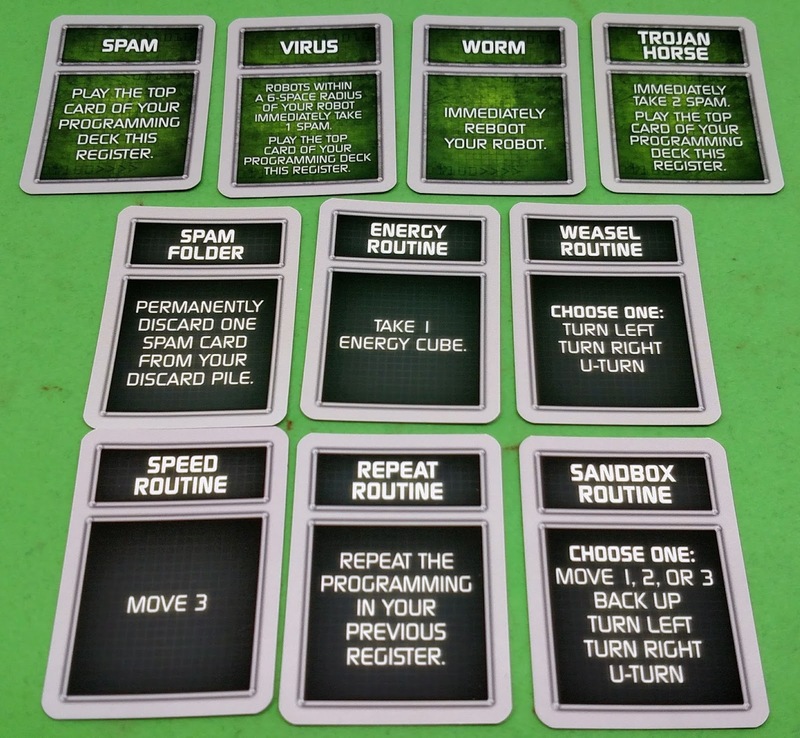 In 3rd edition, robots all reboot at a single designated spot per board (the green tokens with the starter board), so you no longer need to keep track of where you were last archived. In fact there is no archival at all as robots no longer die. Nope, no matter how damaged you get, you just keep going, possibly more and more randomly. You don't take damage tokens anymore, instead you get spam cards into your deck, and the main way to get rid of them is to play them, taking a random card for that register but discarding the spam. This also means (I believe) that you can no longer sacrifice an option to prevent damage. 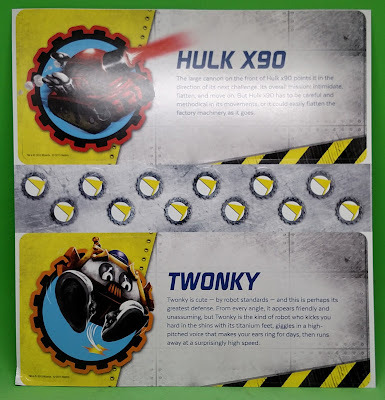 Operation Notes: The Twonky is cursed. It knows exactly what's going on. It knows there is no escape, and it knows that telling the other robots will only make thing worse. Twonkys frequently contemplate self-destruction, but refuse to give the computers the satisfaction. Unit History: The control computer for LOOK-E-77-P decided to place her in the RoboRally after she began starting floor status reports with selected quotes from Nietzsche. On to more robots. The first edition Hulk X-90 was a three legged smashing machine. The sculpt was actually confusing, as many times people thought the third leg was facing forward. Second edition swapped this design out for a tank, and third edition the tank is bigger and nastier looking. Of course the first edition description now no longer fits at all. Squash bot used to roll over other robots, crushing them with under its steam roller wheel. It was scrapped for a modified version of first editions Hulk X-90 instead. Third edition made this less bulky and more stylized. Again the first edition description doesn't fit any more. Operation Notes: Roller BOts like things nice and flat, and they see flatness as a sign that they're doing their job well. Anything that isn't flat is bad, and is perceived as both a challenge and an insult. Luckily, they are very slow. Factory Task: Rolling mil operations. Unit History: Roll-M 2D had a stunning insight one day when he realized that the factory itself was disturbingly un-flat. His attempts to rectify this earned him and immediate slot in the current RoboRally. Hammer bot - hitting things. First edition was always a little strange the the huge tube ending in an eye. 2nd made it very sort and squat. The new third edition sculpt goes back to the humor in the Foglio sculpts - with it holding an actual claw hammer on an arm and bug eyes. Yeah, love this one. However the single hammer loses the humor in the description. Operation Notes: Hammer Bots love their job. 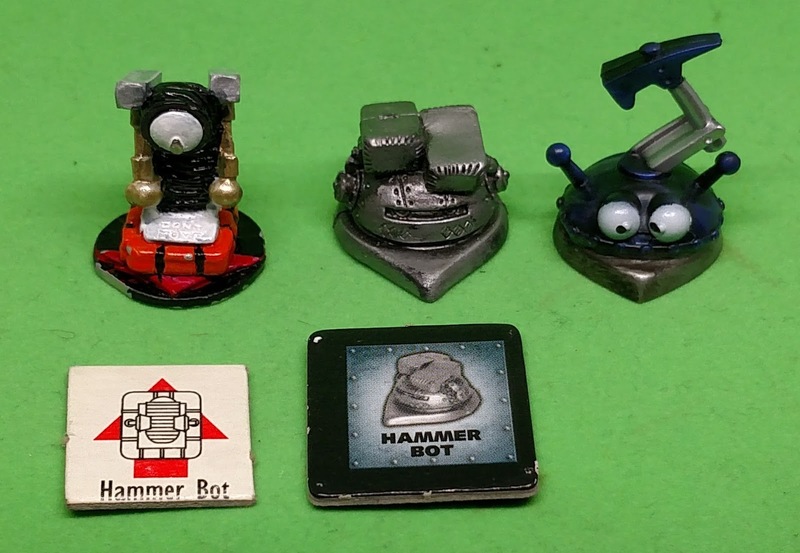 Some computers have speculated that the typical Hammer Bot thinks its job is to be a drummer in a rock band. This drumming tendency annoys some other units, only because they never know when a Hammer Bot is going to break into a drum solo while they're talking to it. Factory Task: Demolition and product size reduction. Unit History: A minor software glitch caused BANG-BANG 47b to begin improvising. She had managed to compose the first three hours of an imaginative, if somewhat repetitive, drum solo when the floor she was working on collapsed. 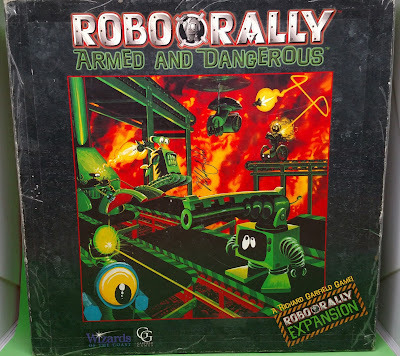 Her control computer decided that the current RoboRally would make for a suitable encore. 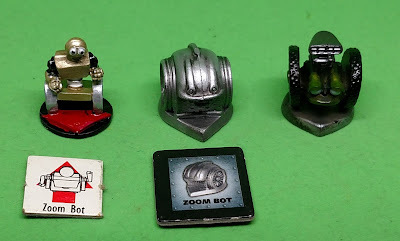 Zoom bot was supposed to be all about speed. The first one was ok, and then the second editon sculpt was just a bit to "art deco" for me. Third edition is better with the big wheels, but the head just doesn't work. 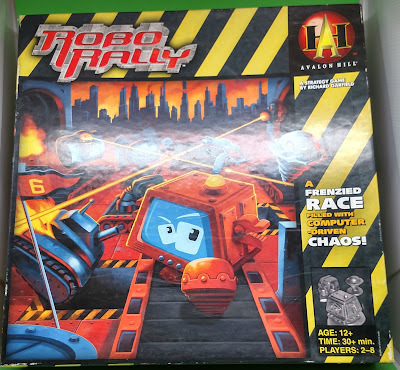 Operation Notes: Inherently unstable (in more ways than one), Zoom Bots are the closest thing the RoboRally world knows to a cheerful personality.l They are convinced that everything has a purpose and that there will be a reward for faithful service to the Creators. They are usually the first to die, allowing the survivors a brief taste of joy and satisfaction into their own miserable short lives. Factory Task: Communications and site hospitality. Unit History: Zip 550 indicated that he would be happy to continue serving on the experimental Explosive Widget Testing Team, but was equally thrilled at a chance to race in the latest RoboRally. The final bot in the 3rd edition is spin bot. Humorous in first as he looks confused, second made him a saucer instead. Third took this even further, making the saucer a saw blade and making the eyes much more menacing - another one I like. Operation Notes: The Spin Bot never stops spinning throughout its lifetime. As a result, it's reaction time is quick and it is able to avoid many dangers. Locomotion is provided by a magnetically secure, universal ball bearing. Balance is maintained gyroscopically. The only part that does not move is the eye stalk which is mounted on a free-floating gymbol. If this seizes up, then disorientation follows instantly, and teh bot is out of control If the happens, get out of the way ASAP. Unit History: WREEEEE-43.3 was damaged during shipping, and his eye stalk tends to freeze up frequently. As a result of this, the unit has spent much of his robotic life completely disoriented and out of control The constant spinning has made his blissfully pleasant, if just a little simple-minded. 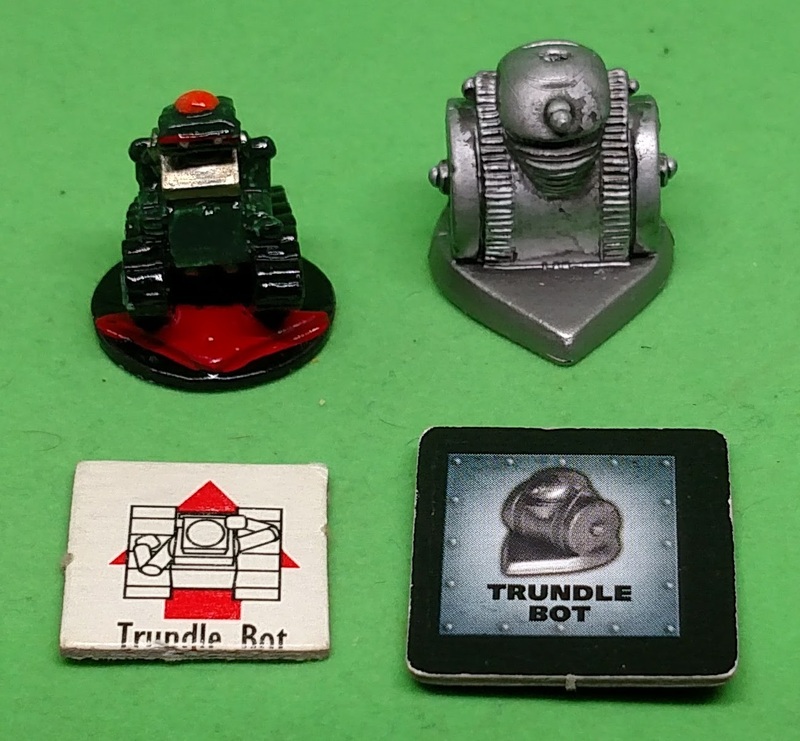 They dropped two robots from third edition - the first being Trundle bot (or trudy). 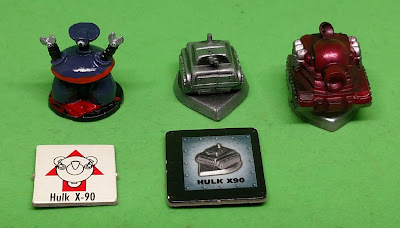 Much more a generic tank robot, the 2nd edition made it much less personable and more into a tank - a role now played by Hulk X90. 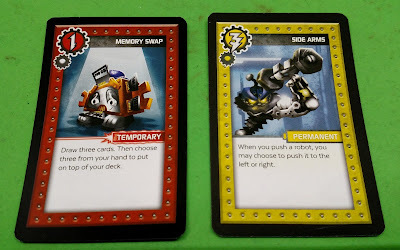 Operation Notes: Trundle Bots are tougher than any other style of robot and on't you forget it. Of course, this is just a matter of degree, and their life spans are as ephemeral as anybody else's. They're just a bit more surprised when they're destroyed. Factory Task: Heavy maintenance and site security. 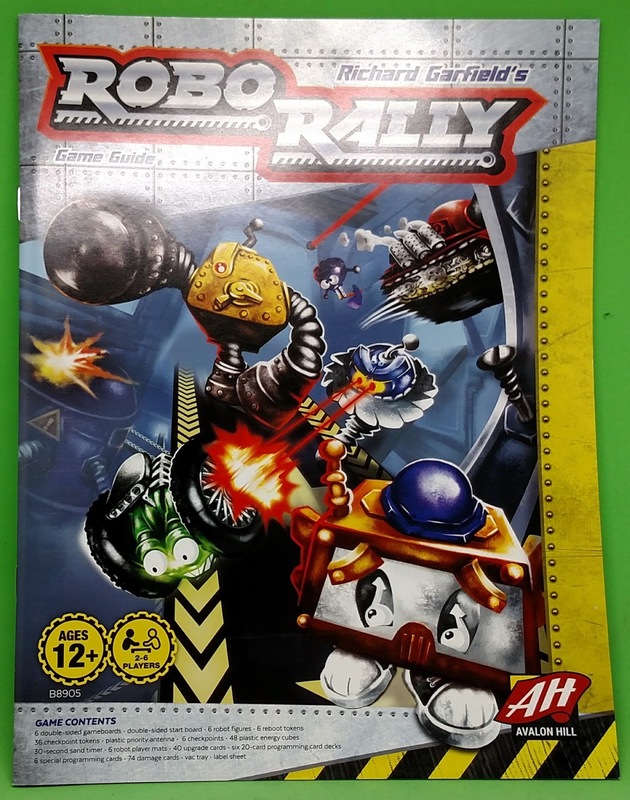 Unit History: BRUT312.k40 was recently reassigned to the Sector 7G Gratuitous Manual Crushing Unit and the excessive glee with which she completed her duties there has earned her a spot in the latest RoboRally. The other robot dropped however was my second favorite (after Twonky). 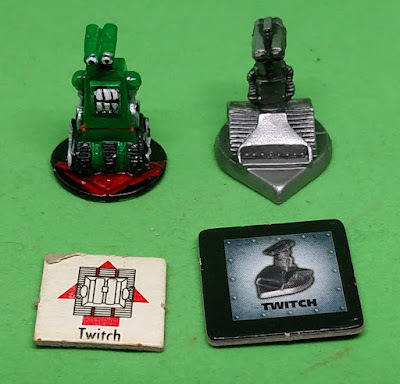 Twitch was just so full of character. He is an inspector bot, so knows EVERY way in which a robot can be destroyed. The original sculpt really shows this (deserved) paranoia. 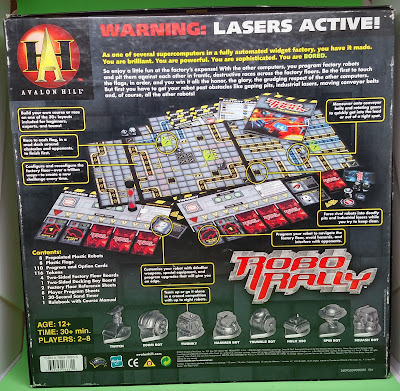 Operation Notes: Inspector Bots determine if units, products, and working conditions in the factory are safe. As a result, they have full working knowledge of everything that could possible go wrong and are instructed to go and see out problems. Inspector Bots twitch at bright lights, loud noises, sudden movement, or nothing at all. The typical Inspector Bot is convinced that the robot next to it is about to go mad and would send out a warning by radio if it didn't know how dangerous even that was. Unit History: EEK-47600-J did an overall site analysis and determined that the most dangerous factor in a robot's environment was its control computer. EEK-47600-J was placed in the current RobRally almost instantly. The last comparison is the flags. In first edition they were cardboard tokens, which slightly smaller ones coming in the "Armed and Dangerous" expansion. 2nd edition saw the 3d translucent green flags and these were a great update. They made it much easier to see where the flags were, and added to the 3d feel of the game. They came with clear stickers for the pennants and bases, showing the number of the flag and a repair wrench. In third edition there are no repair spots any longer (replaced by energy spots / cubes). They did keep the green translucent 3d flags with clear stickers however. So I read through the rule book, and this is not your father's robo rally. It has now become something closer to a deck building (actually it would be deck destruction) game, though in general you only add bad cards to you deck - there are only six good cards that can be added. Let's back up a bit. First are the upgrades. 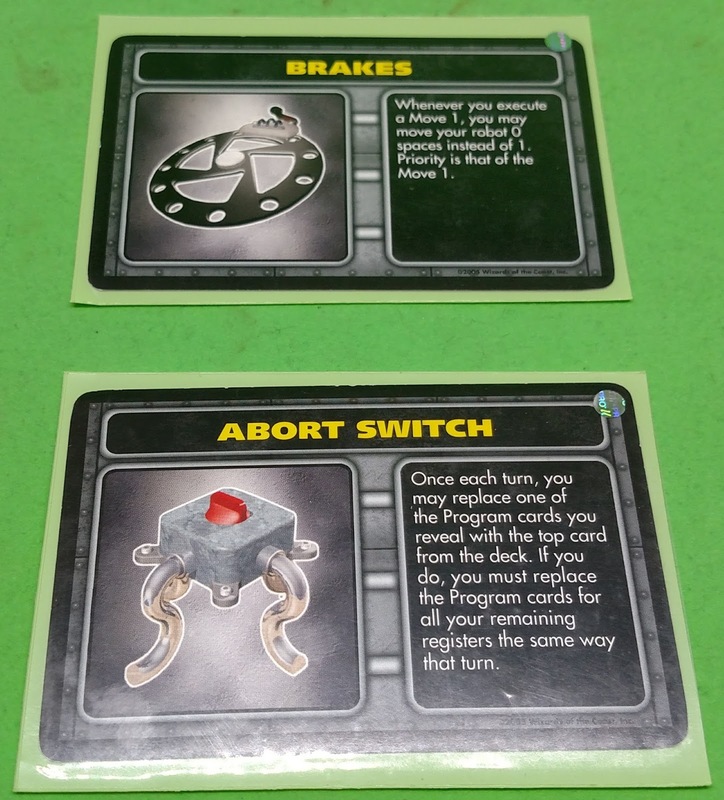 In former editions, these were options, and you could earn a random (draw a card) if you ended your turn on a double wrench space. You could also sacrifice one to avoid taking a point of damage. (Sometimes we would play were everyone would start with a random option to make it more interesting). Some options were significantly more powerful than others (crab legs, brake, arm extension). In 3rd edition, you draw and set out a number of options equal to the number of players, and at the beginning of each round you can use energy cubes to buy an option - these all have prices. There are permanent and temporary (one use only) options - you can have up to three of each. At the beginning of each turn purchased options are replaced with new ones - if no one bought any last turn then all of those are discarded and an entire new set is available. That is an interesting twist. 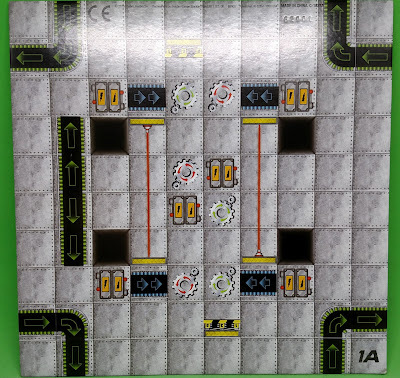 The boards now have battery squares, which each will contain an energy cube you can claim if you stop on it. There is also a program card to give you an energy cube. So now lets look at the programming cards. Each player now has their own deck instead of getting cards from a single large deck. After programming, any remaining cards are discarded, and when you run out of cards to draw you shuffle your discard pile and it becomes your draw deck (just like deck builders). You still program five cards out of the nine you draw each turn. Everyone starts out with identical decks with the same distribution of cards - so no one will get 3 move 3's in their hand (because each player deck only has one). 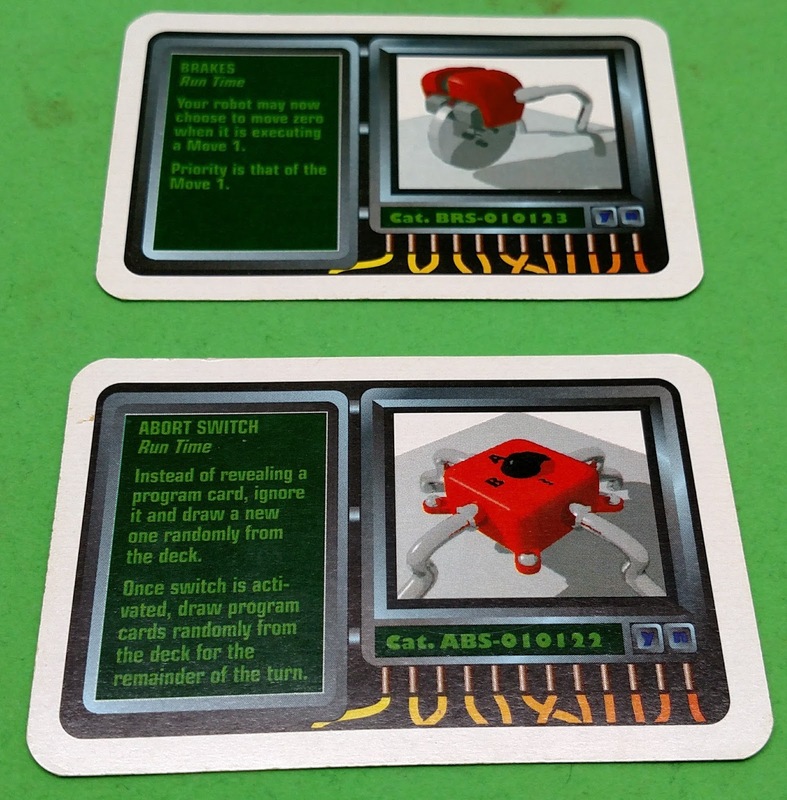 1st edition program cards (I actually found and bought a second deck, though we never play 1st edition any more). I really like the computer aesthetic of these. 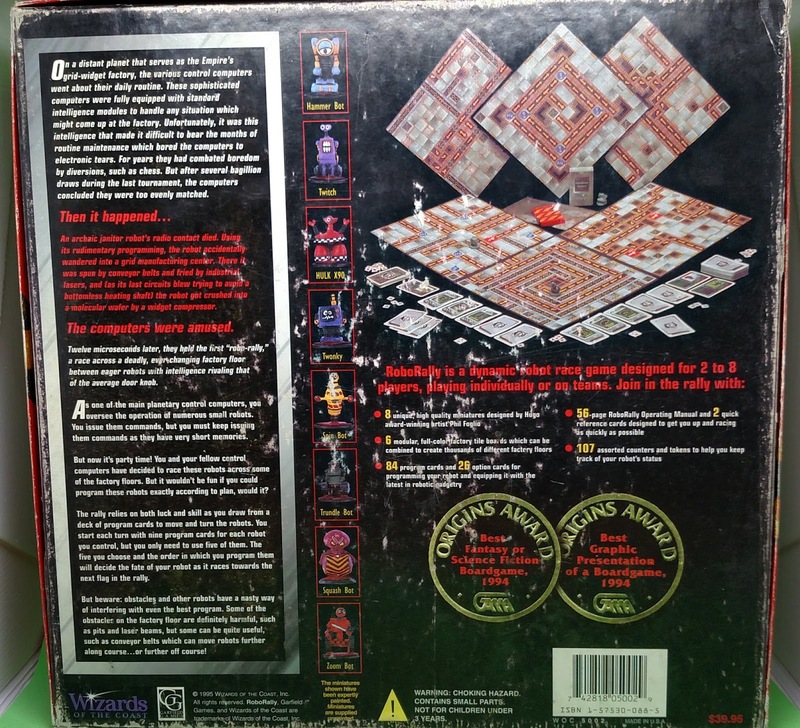 2nd edition programming cards (sleeved) were a bit clearer, but lost some of the cool aesthetic. Damage cards (top row), and the few good cards you can get from temporary options. Those six cards are it - there are no additional copies of any - so very little chance to improve your programming deck at all. Damage has changed dramatically. Instead of taking damage tokens (and losing a card for each token) you instead add spam cards to you discard pile. 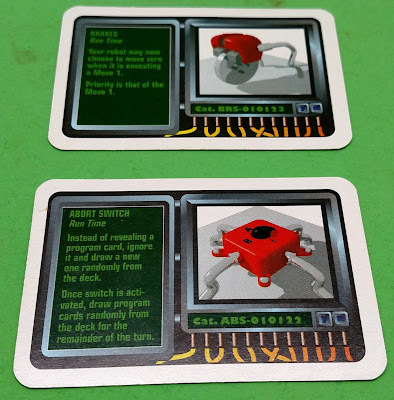 These get in the way of useful program cards, and in general you get rid of one by programming it in a register - where it is replaced (and removed from your deck - back to the spam deck) with a random card from your draw pile. (I don't remember what you do if you draw another spam - I think it goes straight to your discard and you keep drawing until you get 'playable' card). I have a lot of thoughts about this mechanic, and will have to play it a few times to see how it works. Having a card that doesn't move you (gain an energy) is a fantastic option, as there have been many times when just staying put would be ideal (and in 1st or 2nd the only way you could do that was if you had the "brakes" option card. It does seem that movement will end up a lot more random as you try to get spam cards out of your deck, and if you are ever 'destroyed' (which is only by falling in a pit or moving off the board) then you reboot (i.e. re-spawn) on the designated space for the board you died on, gaining 2 spam cards. There are unlimited 'lives' - but it seems you could end up in a bad situation with a hand full of spam and just gaining more. Players are never eliminated now (which is a very good thing), but with no shutdown option to get rid of damage I wonder if a player could end up in a bad position where all they have is spam, and just keep getting more. They have added flag counters - you get one each time you touch a flag in order - so it is a little clearer what place each person is in (how ever many flag counters is the number of the last flag touched). The priority antenna is an interesting way to solve the problem of who moves first now that everyone has their own decks (previously the lowest numbered card went first). Now it is the robot closest to the antenna. I'll reserve judgement until I try it - however with all the robots being pre-painted - it is just sloppy that this is plain white plastic. Would it really have been all the more expensive and difficult to paint all seven pieces instead of just the six? 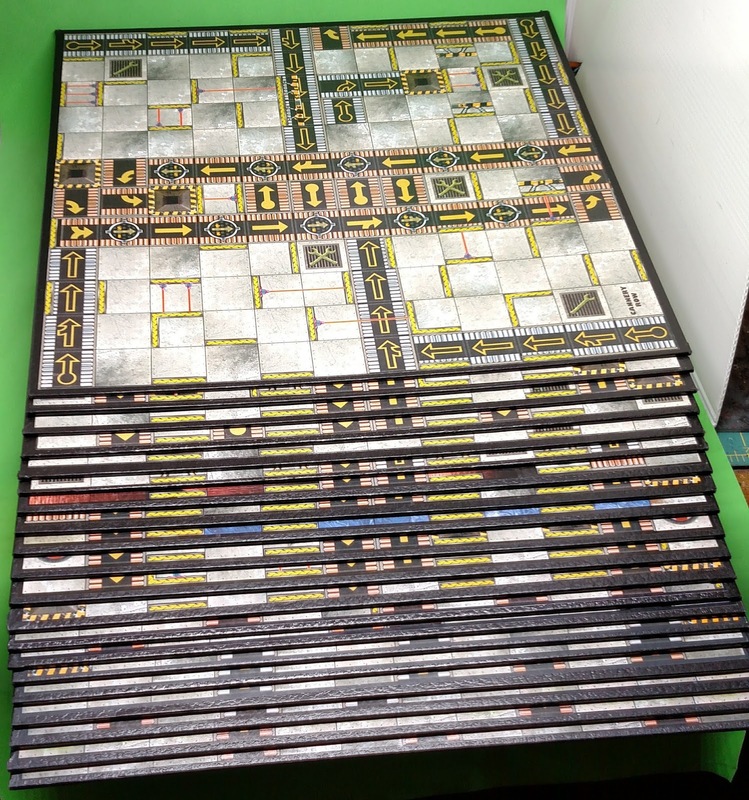 The book does have many board designs, but it appears all the boards are new. This is a bit of shame that some of the older, famous boards are now gone (though I assume they could be used - changing wrenches to batteries. 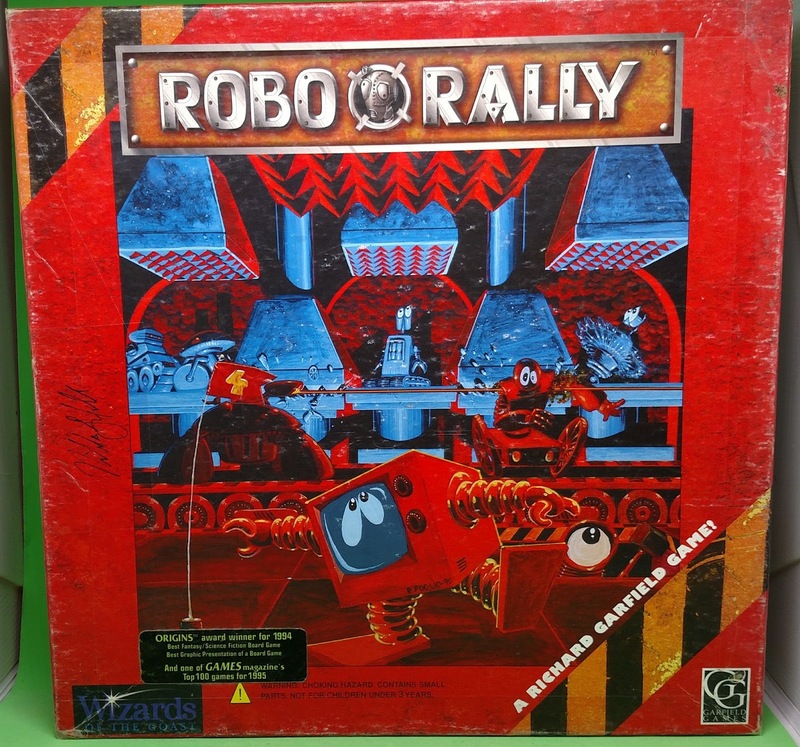 One of the issues with robo rally has always been that a leader could break away and be unable to be caught. The addition of more forced randomness (i.e. the spam cards) may help with this. Robot interaction was always one of the best aspects of this game, and that is still there. Playing spam cards to get them out of your deck now also works similarly to having another robot push yours - you now are not where you expect to be. 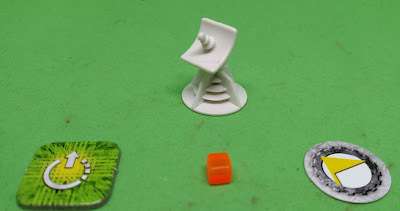 This often gives the most amusing moments in a game - where a push at the wrong time puts you in a pit, or on a conveyor belt to the other side of the board (or, if you are some kind of mathematical genius, exactly where you want to be). I will have to scan the rule book again - I wonder if Garfield was involved in the reboot - and whether he was or not I am curious as to what he thinks about the new version. Which I found just by looking him up on board game geek - you can read his thoughts here. (You can use this link to see all of his responses (newest first, so go from the bottom up) which are, to me, the interesting part (more so than other random people's comments)). Knowing that most of the changes were his (and not Hasbro's) makes me give them more credence - the ideas of the original creator vs a company are almost always better (ok, no so much with George Lucas and the Star Wars prequels). A good example was the most recent "Hitchhiker's Guide to the Galaxy" movie - which had two completely new scenes (the dolphins singing at the beginning, and the traps that slap you in the face if you think) which I wasn't sure about until I saw the those two were written by Douglas Adams before he died. I look forward to at least trying the new edition to see if we enjoy it as much as the old.